I know I'm not the only one who thinks Somoas are the best Girl Scout cookies HANDS DOWN. That combo of coconut, caramel, chocolate... I do not buy them anymore cause I can eat the whole box in a day. And that is not a good idea for my health or my waistline. 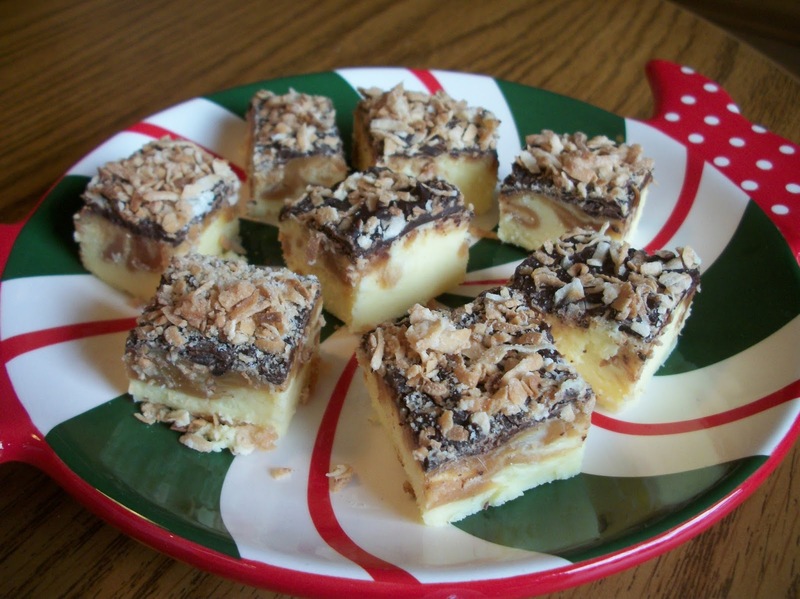 I just love how nice this fudge looks, too - the waves of caramel and the crunchy toasted coconut on top really make this a great addition to a cookie/candy tray. Find more great Christmas cheer at Inspiration Monday, Mix it Up, Clever Chicks, Show and Share, Fabulous, Create Link Inspire. 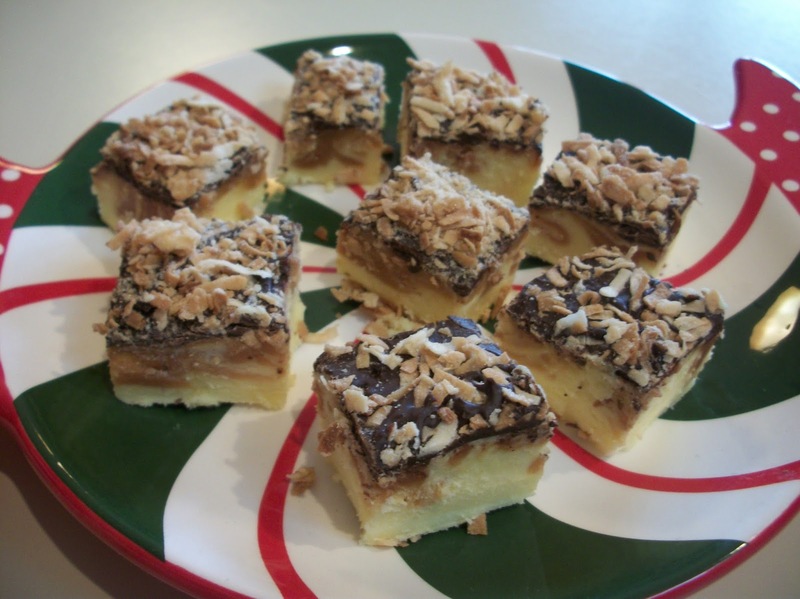 Spread coconut on a baking sheet. Toast in the oven at 375 for 5-8 minutes, checking after 5 minutes, and shaking the sheet to redistribute the coconut for even toasting. In a large saucepan, heat butter, cream, sugar and salt on medium high heat. Bring to a boil, stirring constantly. Cook and stir for 5 minutes then remove from heat. Combine pudding, white chocolate chips and marshmallow fluff in a large mixing bowl. Pour butter and sugar mixture into the bowl, and mix, using an electric mixer, until combined and chocolate is smooth. Immediately pour into a parchment paper lined 13x9 baking dish. Melt caramel bits with 1 tsp. heavy cream in microwave, stirring every 30 seconds until smooth. Pour caramel over top of fudge. 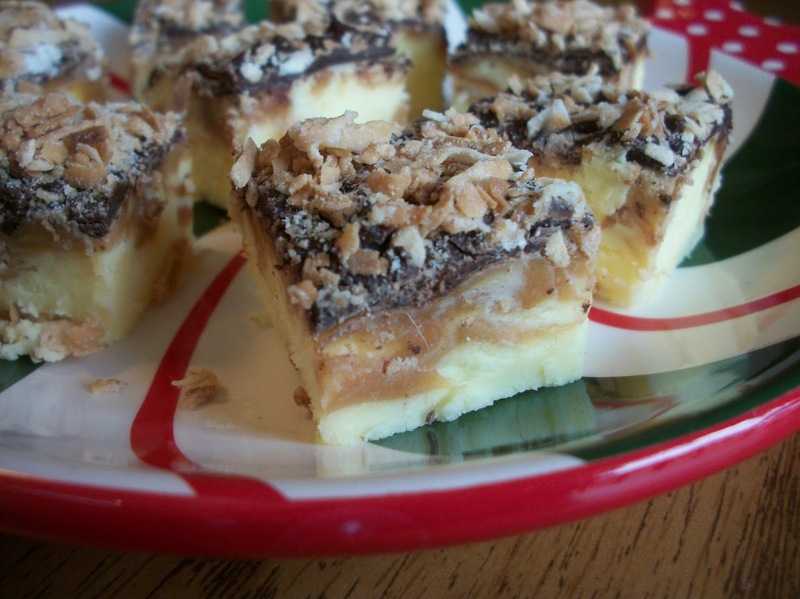 Use a knife to spread and swirl it into the fudge. Refrigerate fudge for 2-3 hours until set. Melt semi sweet morsels in a small bowl in the microwave at 50% power, stirring after every 30 second interval. Spread over set fudge and sprinkle generously with toasted coconut. Lightly press the coconut down into the chocolate to be sure it sticks.